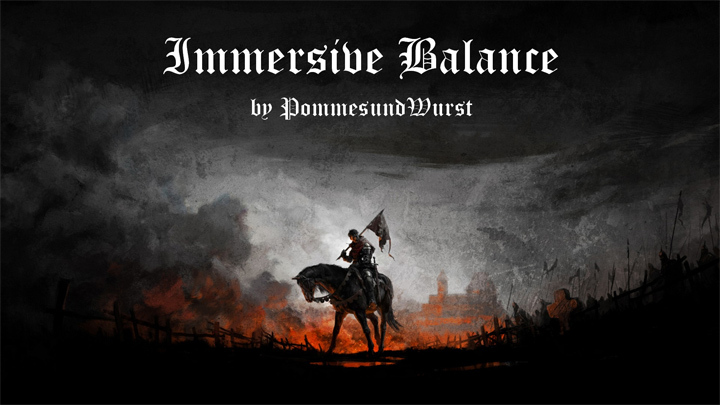 The file Immersive Balance v.1.4 is a modification for Kingdom Come: Deliverance, a(n) rpg game. Download for free. This mod drastically improves the game-balance. While aiming for as little change to the core-mechanics as possible and improving on the internal-logic of the systems set in place by Warhorse. Therefore providing a far more immersive experience. There are far to many ways to cheat the system and accumulate a lot of money early on. It is far to easy to get your hands on the best armors as soon as you enter the openworld. And there are basically no penalties for using it. While it takes a little longer for this to have an effect compared to the other two. There occurs a very sudden spike in damage dealt by the PC with Weaponskills over 10. Leading to scenarios where midgame bosses can be killed within one strike. Additionally this mod provides minor changes to Items, game-systems and NPC-AI that go a long way in improving on the consistency of the gameworld. - Suitable independent of ingame progress! - Equipment and Combos actually matter! - Improvements to item-balance and Economy. - More elegent solution to Damageoutput. Dark Times and many others simply limit the max-dmg the PC can deal. an Endgame-Character will deal 100dmg everytime. This doesn't happen here. - The most important changes in "Dark Times" are also implemented here in one form ore another. intended. Although this will probably change at some point, when it leaves Beta since the author is a really dedicated modder. If you encounter any trouble nontheless, have additional ideas or requests for adjustments feel free to leave a post.